Any one have any recomendations regarding a wider rear tire on an 81 prolink? Do any suppliers or shops build a swing arm to accomadate a wide tire and wheel? Maybe as wide as a 240? I've heard if you use a 240 rear, the front wheel needs modified also and probably will need a dual chain drive at the rear. Has anyone tried this type of layout and was it a road worthy configuration? What's the widith limits within the scope of a single chain drive and modified stock swing arm? 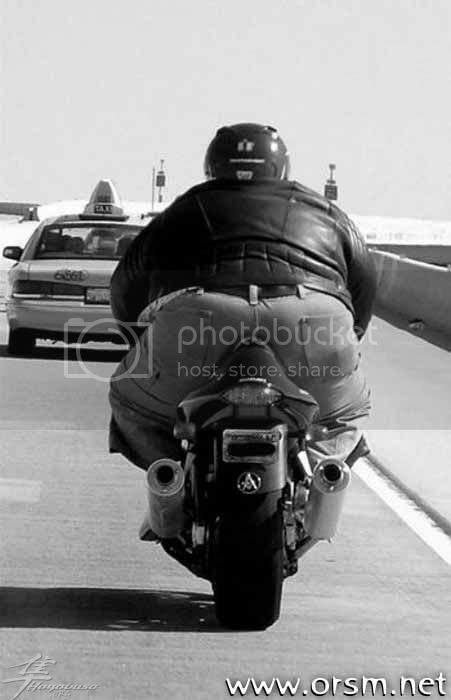 Even this guy's only running a 190... That's what my Hayabusa has. Are you having dreams of ill handling cruisers lately? Last edited by ICOA WebTeam on Sat May 08, 2010 5:37 pm, edited 1 time in total. Not savvy on the Prolink George but over the years I have gone with different tire setups & found the skinny front with a wide rear to be detrimental to handling... Only when I have returned to a reasonable setup has my handling improved. George R. Garrison #0857 wrote: Any one have any recomendations regarding a wider rear tire on an 81 prolink? Unless you want a really ill-handling bike or you just want to go fast for 1/4 mile straight, you probably should not exceed a 160 in the rear on a conventional chassis geometry CBX. I have two sets of wheels for my Ducati 916 and when I take it to the track, I run a 180 in the back instead of the 200 for the street. The difference is unbelievable. 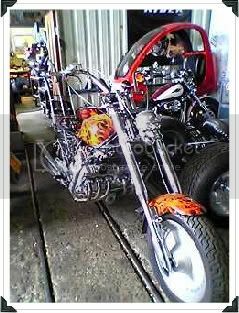 Now, you have a CBX-chopper, spoke, I understand, and this is an exception. Handling is not a priority I take it, so anything is allowed, however, I still think a 240 will not fit into a CBX swingarm of any kind. The front part will be too narrow. Last edited by EMS on Sun Nov 08, 2009 11:47 am, edited 1 time in total. I actually believe you can get used to the feel of most things once you have traversed the learning curve of their peculiarities. It could also be said that bikes capable of fantastic handling & performance are sometimes beyond their riders. Spoke wrote: It could also be said that bikes capable of fantastic handling & performance are sometimes beyond skill of their riders. 2. There is no need to speculate on how 240 or 320 rear tires effect bikes since if this was the path to great handling all sport bikes would have these tires, but I am sure with your background you already realize this. Specific handling clues are out for you to check out now since Victory already makes a bike with a 250 rear tire....the Victory Jackpot which you can check the video road test report on the link below or at your option take out for a demo ride at your local dealer and get back to us with how it all worked out. Sure the Victory Jackpot has no ground clearance nor is a CBX with a 240 kit...but this will give you a general idea of what to expect. Video comparison test....comments on Victory 250 rear tire handles appear in first 2 minutes. 3. Sooooo.... I encourage you to take your time....do your due diligence....and give it a go if this is what you decide to do........heck why not? You guys really make some amazing stuff......great website also. Spoke wrote: It could also be said that bikes capable of fantastic handling & performance are sometimes beyond their riders. Dangit, will you guys stop talking about me.